A 1905 plat of Pender Street property shows that John Spells (or Spell) owned this lot as early as 1905. The house has been demolished. In the photo above, Ash Street (parallel to Pender) and its elbow intersection with Darden Lane (formerly Darden’s Alley) are visible beyond the vacant lot at 204. The darker green area at left marks the former continuation of Darden Lane to Pender Street. Today, a foot path — just visible below the green house at far left — snakes diagonally to exit into Pender via the former driveway of 208 North Pender, the now-demolished Best house. In the 1920 census of Wilson, Wilson County: on Pender Street, carpenter John E. Spell, 50, wife Martha A., 39, and son John E., Jr., 16. In the 1925 Wilson city directory, the following are listed at 204 Pender Street: Jno. S. Spell, carpenter; Jno. S. Spell, Jr.; and Martha A. Spell, dressmaker. In the 1930 census of Wilson, Wilson County: at 204 Pender Street, building carpenter John L. Spell, 65, and wife Martha, 46, a seamstress. They owned the house, which was valued at $3000. In the 1940 census of Wilson, Wilson County: at 204 Pender Street, odd job laborer J.S. Spell, 74, born in Pitt County, and wife Martha, 65, an invalid born in Oxford. Grocery deliveryman Arthur Darden, 27, and his wife Bettie, 19, rented rooms in the house. John Stephen Spell died 31 January 1946 at Mercy Hospital in Wilson. Per his death certificate, he resided at 204 Pender Street; was married to Martha Spell, age 61; was 80 years old; was born in Pitt County to Easter Spell; was a carpenter; and was buried in the Masonic cemetery. M.G. Spell was informant. 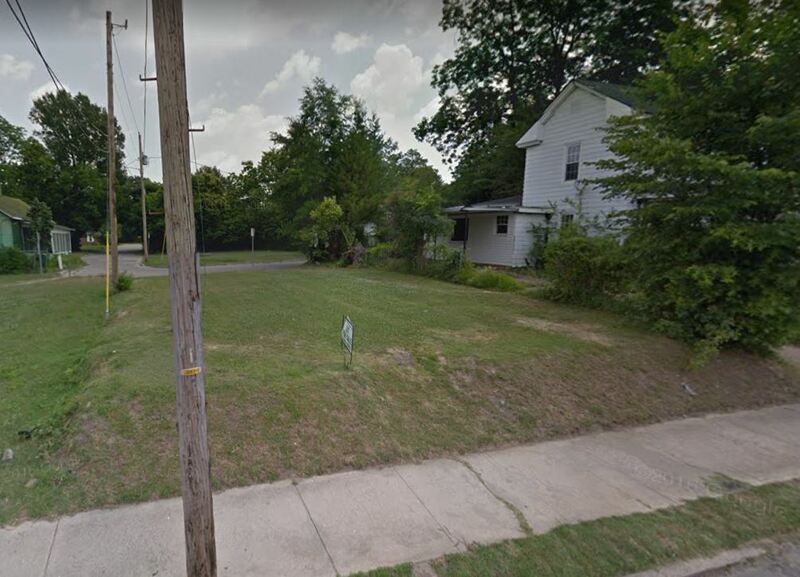 The Public will take notice that the Board of Commissioners of Wilson County has received and proposes to accept an offer to purchase the property located at 204 North Pender Street, PIN# 3721-59-1516, in the amount of $1,000. Additional information may be obtained by contacting the County Manager’s Office, 252-399-2803, 2201 Miller Road South, PO Box 1728, Wilson, NC 27896-1728, http://www.wilson-co.com, or by email amparrish@wilson-co.com. Any person may raise the bid within ten (10) days of this notice. The bid must be raised by at least 10% of the first $1,000 and 5% of the remainder. The raised bid must be delivered to the Clerk to the Board located in the County Manager’s office and must include a 5% bid deposit. Raised bids will be advertised until no further qualifying upset bids are received. 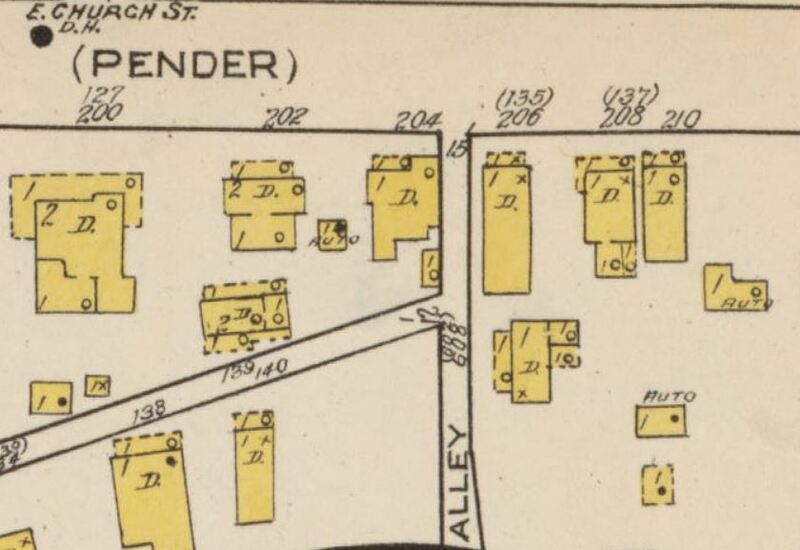 The 1922 Sanborn map of Wilson, N.C., shows the original course of Darden Alley hard by the north edge of 204 North Pender. 204, 206 and 208 have been razed.